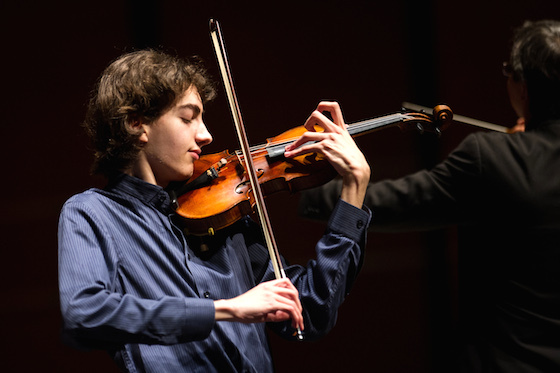 AUSTIN, Texas — By any standard, the music-making was exceptional at the Senior Finals concert for the Menuhin Competition, in which each of four finalists performed a full concerto with the Austin Symphony Orchestra for a full crowd of more than 2,000 at the Long Center for the Performing Arts in Austin, Texas on Saturday. We know how it all came out, but I will do my best to bring you there with words. Unfortunately, the Competition was unable to obtain permission to liveeam or record this concert. However, Sunday's evening Gala Concert will indeed be liveeamed at this link. It will feature the Junior and Senior first prize winners, the Cleveland Orchestra, and jury member, violinist Arabella Steinbacher. 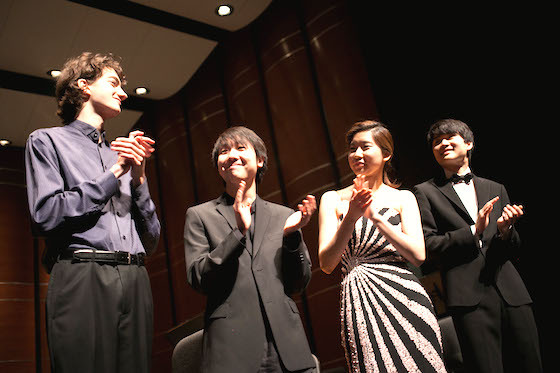 On Saturday, our performers for the evening were the Senior Finalists: American Stephen Kim, 18; American/Korean Christine Seohyun Lim, 19; American /Dutch Stephen Waarts, 17; and Korean In Mo Yang, 18. Every performer was younger than 20, but each played with professional polish, reliability and presence. To hear any one of them at a symphony concert would be a pleasure, to hear all four in one night -- what a treat! 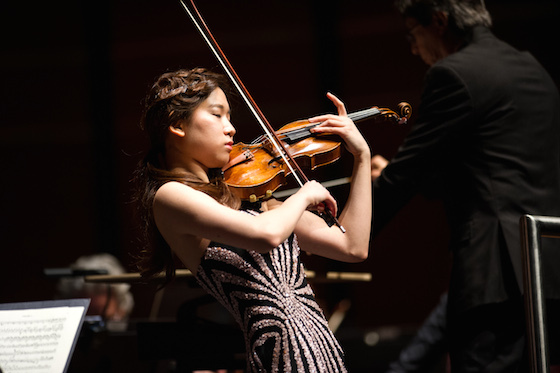 The evening opened with a performance by Christine Seohyun Lim, who played the Mendelssohn Violin Concerto. Ah, the opening of the Mendelssohn Concerto -- so pleasing to the ear and so awkward for the fingers! Not for Christine. Her opening was absolutely solid, with dead-center intonation and a beautiful musical line. Throughout the piece, she coordinated well with the orchestra, and her first movement had some exquisite moments of silence, particularly in the cadenza. She really kicked out the triplets that often get lost, for an intense and effective accelerando at the end of the first movement. The second movement opens with a singing melody, and hers was so vocal, I could almost hear the lump in the singer's voice from being on the verge of tears. Best of all was the last movement. As I listened to the dizzying 16ths, I suddenly understood her (awesome) swirly mermaid dress and how it related to this piece! Beyond dizzy, it was smiling, playful, and a wash of notes, like a back-and-forth conversation with the orchestra, or maybe a playful chase. What invigorating playing. 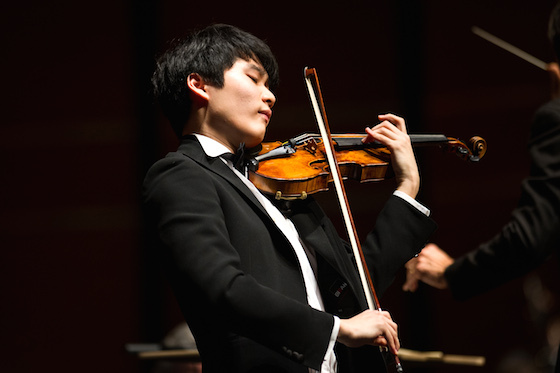 American Stephen Kim, 18, played Prokofiev's Violin Concerto No. 1 in D Major, Op. 19. This concerto opens with a haunting and continuous line, which he played with a lovely tone. Eventually the music maxes out at the top and breaks into kind of a flurry. Here, orchestra and soloist were not together (and this happened a second time with In Mo Yang's performance of the same piece, so we can't blame the soloist entirely). Stephen's high filigree at the end of the first movement was accurate and other-worldly -- this movement seems to end in outer space and fly off on an alien ship. Stephen's playing brought forth some vivid images for me. Prokofiev is hardly cream-puff music; especially in the second movement "Scherzo vivacissimo," which sounds brutal and spooked out, like running through a kaleidoscope of distorted and unpleasant images. The end of the last movement sounded to me like a warbling bird that loses its balance and falls from the sky, then returns and makes it to the top. The audience fell silent for a long time, then much applause. After an intermission, Stephen Waarts performed the other Prokofiev Violin Concerto, No. 2 in G minor, Op. 63, which begins low and spins out a line that seems quite melodic until it breaks into spikiness. The first movement is full of interruptions and nonsequiturs: fast playing that sounds out-of-breath and hurried. Stephen was pulling off broken bow hair already by the first orchestral interlude. I have to note that conductor Peter Bay, excellent partner that he was, kept smiling at the soloist, and this seemed so incongruous to me in this piece! The way Prokofiev set up this piece, every time the movement seems to get going with a gorgeous melody, it trails off into choppy waters. At those times, when the music presented a thick texture of busy string crossings, angular double stops, big leaps and notes, Stephen was always able to find the musical line through it all. The second movement has a clear melody and statement, and Stephen made it with gorgeous tone and well-suited vibrato. Stephen also had no trouble landing the sudden and extreme leaps up the fingerboard to catch very high notes. In fact, this movement has some of the highest notes in the violin repertoire, and they sounded just gorgeous in his hands. The last movement was a wild, rollicking, evil dance with lots of double stops. The music fits together like a complex and intricate clock made by a madman genius. There's a great deal of fast-paced asymmetry and offsetting things by just a few notes. It sounds wrong when it's right, and so how does one know if it's right? On this night, I finally knew. In fact, I heard a few things I hadn't heard before because they meshed just right; I saw how they fit. The movement ends in relentless and rather repetitive passagework, but Stephen had us hanging on every note. 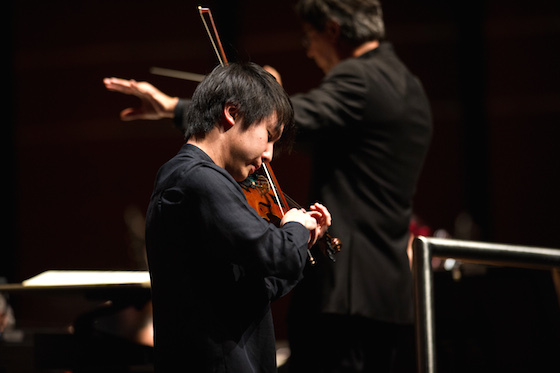 Korean violinist In Mo Yang, 18, gave the last performance of the evening, Prokofiev Concerto No. 1 in D major, Op. 19 (the same piece that Stephen Kim played). As I mentioned, the orchestra and soloist had some ensemble problems toward the beginning, after which all went well in terms of collaboration. In Mo also was able to take a thicket of notes and give it meaning; in this case, a certain jazzy and syncopated feeling. His moments of stillness were very effective, and his high filigree at the end of the moment really rode the flute (piccolo?) solo. The second movement was indeed "vivacissimo" -- so fast! There is a series of fast glissandi up the fingerboard, and he nailed the harmonic at the top of each one every time. The end was so fast it sounded like a bee buzzing around the room -- a very in-tune bee. The last movement sounds like a series of attempts to climb up the side of a mountain, each climb a little different. His pacing and dynamics really helped build the tension, until it goes back to the the simple theme from the first movement, set to trills. In Mo's trills are really, really fast. Beautiful playing, and he got a standing ovation. And speaking of a standing ovation, take note of these young artists and all those who participated this week in the Menuhin Competition: They are the future of music! Can you tell us why we were not able to watch the senior final concert? It was such a disappoinment last night, after following them all week, to not watch these wonderful musician in their final concert. As I understand it, it had to do with being able to gain permission to record the professional orchestra. Such a pity, an oversight perhaps? This doesn't make the orchestra look very good. One would hope that they could have negotiated a deal among the competition, the orchestra and the venue to record and sell the recording to split the revenue afterwards, a win-win situation. Fortunate for us to have such a good music critic to report the event for us. Thank you so much for doing such an exceptional job, Laurie! I must admit that I'm seriously bummed out. Between crazy workload and a death in the family, I couldn't even make it down to UT for any of the events. I live in an Austin suburb, so this would have been a great opportunity to see the Menuhin competition live, but I guess it just wasn't supposed to be.